Check out our interesting range of banners that will enhance Main Street Charm during events and celebrations. You can use these brilliantly colored street banners from Tuff Flags as a daily decorative fixture to add color to your streets or as special enhancements only during special events made from premium quality vinyl fabric, these banners are maintenance free and waterproof. Featuring UV resistant inks, these banners enjoy long lasting vibrant prints and attention getting beauty. Fitted with high quality solid brass grommets and 3" sleeves for attachment, these Main Street Charm Banners will let you paint the town in vibrant colors literally! Shop from our complete line of Main Street Charm Banners right away and take advantage of our extremely competitive prices, quick shipping and much more! 100% customer satisfaction guaranteed! Main Street Charm Banners from Tuff Flags are perfect for spreading the holiday atmosphere in your city, town or building. Made of heavy duty vinyl fabric, these brilliantly colored street banners will make head turning fixtures to promote events, to get your message out or to add a pop of color to your neighborhood or shopping center. Customize it the way you want and enjoy the comjpliments! Our banners are available in various models like street banners and across the street banners. Perfect for holidays, change of seasons or celebrations, these banners add specks of color to your location and grab attention of anyone who sees it. 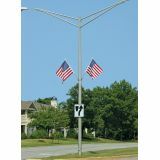 When you need something larger than life to get your message across, look no further than these massive across the street banners that are great to decorate the streets of your town, celebrate the victory of the home team, welcome deployed soldiers back or more. 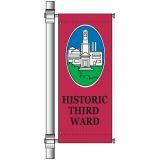 Browse our complete line of Main Street Charm Banners and choose a banner that will never fail to impress your audience. For orders or questions call us at our toll free number (888) 287-3524 or email us at customercare@tuffflags.com.